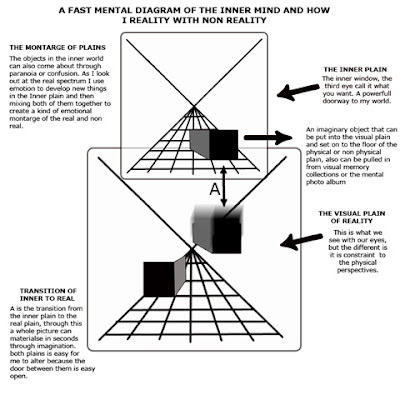 Below is a diagram that burst into my mind earlier today, I get diagrams a lot in my head but have never really drawn them up, I got this diagram in a similar way to how I see visions to paint and draw. Maybe you may think that I am strange after looking at it but it is in way very truthful to how I live within my own world and how it links to reality. Next I will do a diagram on how telephonic sounds create pictures so that I cope with spelling and how I picture numbers in order to do math. I hope this diagram is insightful to anyone interested in visual thinking and its state. If the diagram is to small I will increase its size .